Note that you need to put Disallow: / if you don't want the bot to archive your site. Has there been a change with the IA bot? If so, when? What is the recommended way? Should I just allow all three for now and hope that IA will not change their bot name again in the future? Update: As @KevinFegan notes in the comments, their documentation changed. The below part describes how the Internet Archive handled it in the past (at least in 2014). Their FAQ How can I have my site's pages excluded from the Wayback Machine? refers to Removing Documents From the Wayback Machine, which documents that their bot is called ia_archiver. Will the robots.txt on your site Disallow (block) Wayback from crawling your site. Will Wayback crawl your site. Keep in mind that it might take a while (perhaps a good long while), for Wayback to notice any changes you have made to robots.txt. In the box at the TOP of the page, enter the URL of a page on your site, and click the "Browse History" button. Or, in the box under "Save Page Now" (currently near the bottom on the right), and enter the URL of a page on your site, and click the "Save Page" button. You will see an error message indicating that Wayback can't access pages on that site due to "robots.txt". You will see the "calendar" of historical save points for the page on your site. In this case, you know that Wayback is NOT blocked from crawling your site. Or, you will see a message indicating that Wayback doesn't have an archive of that page, and an offer to click a link to add the page to Wayback. In this case also, you know that Wayback is NOT blocked from crawling your site. Will Wayback crawl your site? Just because you Allow Wayback to crawl your site, doesn't mean that they (ever) will crawl your site. Others have left comments/answers indicating that Archive.org no longer honors robots.txt. Perhaps this is a "work-in-progress" and it will eventually be the case, but I have not seen this new behavior yet. The case for this seems to come from this article: Robots.txt: ROBOTS.TXT IS A SUICIDE NOTE by archiveteam.org. While that page has little if anything good to say about "Robots.txt", it doesn't mention anywhere that Archive.org will no longer honor robots.txt. Also of note: that article is hosted on archiveteam.org, which is most definitely not archive.org, and I'm not sure there is any (official) relationship between archive.org and archiveteam.org. The "Items sold" page opens: http://offer.ebay.com/ws/eBayISAPI.dll?ViewBidsLogin&item=131795294232 Copy the link to the clipboard. Goto web.archive.org, and paste the link from eBay. 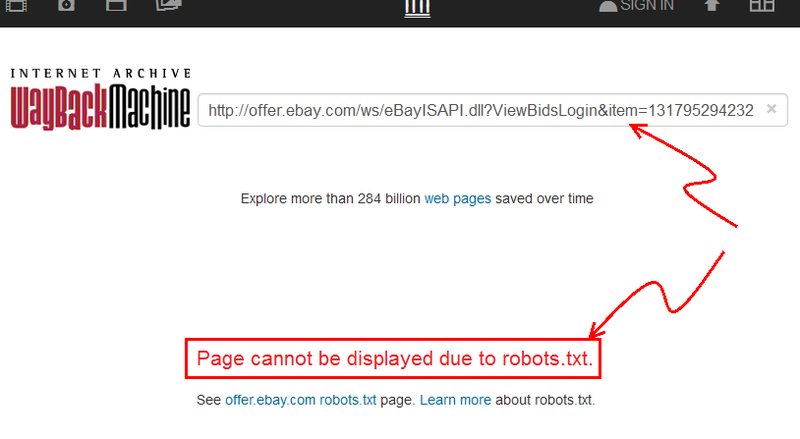 You will see that archive.org indicates that the "Page cannot be displayed due to robots.txt." So, at this time, I remain unconvinced, but I would love to be proven wrong... it would be great if it were true. The robots.txt ia_archiver Disallow entry (with the "/") should be fine for the need you describe (to "preserve for eternity", but not yet publicly). I just did a quick test, commenting out the ia_archiver Disallow entry for a site that had it for at least the past 10 years. Then I looked the site up on archive.org/web, and it showed up grabs it had collected in 2007, 2008, 2009, 2011, 2012, 2013, 2014, 2015, 2016 and 2017! This means that Archive.org never strictly honored what others thought to be a "do not archive" statement during these years, it was merely not exposing the archived copies. Archive bot now does not care about your robots.txt. If you really want to block it, send them a email according to this page, or block their IP address via htaccess. "ia_archiver" is now (ab)used by Alexa, some sources say: 1, 2. Not the answer you're looking for? Browse other questions tagged web-crawlers robots.txt internet-archive or ask your own question. Control over the Internet Archive besides just “Disallow /”? Does the adsense bot ever get bored? Does Google Preview obey Robots.txt? Is there any reason to allow Yahoo! Slurp to crawl my site? How to make “crawl-delay” works for all “user-agent” in robots.txt or in .htaccess? Why is Google saying that the User-Agent line is invalid?